When a friend told me today that Thanksgiving is only eleven days away, I thought they were joking…how can it already be the holiday season?! We just moved to the city! But the Christmas lights are beginning to be put on the trees, the holiday displays are set up in store fronts, and Mariah Carey is blaring through speakers on Michigan Ave. The Christmas parade is Saturday, and many of us from Chicago Semester get to be in it! With Thanksgiving and Christmas approaching, the reminder is there that we only have a few weeks left in the city. Because of this realization, I have been trying to soak up as much as I can, spending enough time in my activities instead of rushing from one thing to the next. Below are a few examples of ways I have been attempting to be in the moment as the time in Chicago is wrapping up. At my internship at North Side Housing and Supportive Services, I have had the opportunity to work on a collaborative survey between NSHSS and Heartland Health Centers. We are working on understanding the impact of the Health Neighborhood Program, which is the collaboration between Heartland and other organizations like NSHSS. This has been a fantastic opportunity for me as my main interest in social work is health, and I am able to discuss at length with participants their experiences regarding the clinic and their health history. I have attempted to be as present as possible, listening fully to these participants and their stories. The Arts and the City class has given numerous opportunities to experience art in ways that I normally would not attend. We went to the Chicago Symphony Orchestra a week back and it was a fantastic time of listening to strings that played in unison, brass that played harmonies that perfectly complemented each other, and a solo harp that reverberated around the grand hall. Spending time taking in these art experiences allows for new experiences to be had all over the city. The Lakeshore trail has been the space that allows me to unwind after a busy day of hearing houseless individual’s stories, filling out paperwork, and conducting surveys. Since Daylight Savings, it is dark by the time I reach the trail, but it is still as busy as ever, people simply now wearing neon when jogging or biking. 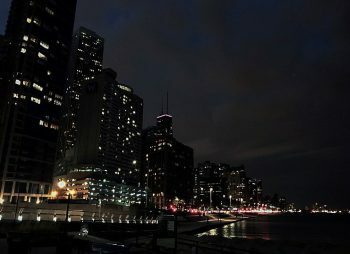 Spending time taking in the city lights next to Lake Michigan give fresh air and views that cannot be matched. The times spent with my friends here in Chicago Semester are memories that I will remember for a long time. From going to the Bulls vs Cavs game, meeting Jason Tartick (!!! ), visiting various coffee shops, walking around the city together exploring new areas, listening to the street musicians, tasting new food at different restaurants, and simply attempting to navigate the CTA and busses, have given both laughs that last for hours and deep conversations where we learn from and listen to each other. 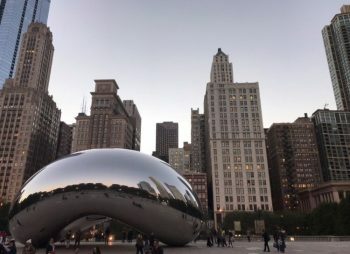 Although all of us student’s time in Chicago is wrapping up, I am anticipating many memories still to be had and look forward to continuing to experience more of the city.